Art deco style map of Paris, France. This extremely appealing c. 1928 art deco style pocket map of Paris, France, combines the virtues of a map and a view. Covers the embastilled center of Paris and the immediate vicinity from Billancourt to Aubervilliers and from Puteau to Charenton. Paris proper is colored in appealing pastels and exhibits more 'map-like' qualities in the layout of the streets, trains, and bridges. Important buildings are shown in profile, including the eiffel Tower, the Arc de Triomphe, Sacre-Coeur, the Pantheon, and others. The regions outside the walled city are mostly in view format, with a horizon in at top and trees, buildings, and bridges shown in profile. An altogether marvelous decorative map. Issued with its accompanying guide, bound in red linen. Features 13 pages of text with guides to museums, hotels, shops, and other advertisements. This map was issued in various editions by Garnier, Leconte, Joly, and others from, roughly 1900 to 1945. Though most examples are undated we can assign an approximate date due to the development of the Metro system and the map's overall style and construction. In this case the Richelieu-Drouot Station, which opened in 1928 is not shown, though the 9 line to Antin is, suggesting that this map was published early in 1928. engraved by L. Poulmaire, printed by Dufrenoy, and published in Paris by Librairie Garnier Frères. Garnier Frères (1833 - 1933) was a large and prominent publishing house and bookstore based in Paris, France. The publishing firm was founded in 1833 by the brothers Auguste (1812 - 1887) and Hippolyte Garnier (1815 or 1816 – 1859, photo at right). Their younger brother Pierre-Auguste (1807 – 1899) also joined the firm. Yet another brother, Baptiste-Louis Garnier (1822 - 1893) joined in 1844. The popular Paris bookshop, located in the arcades of the Palais-Royal in the gallery Peristyle Montpensier, followed shortly after in 1838. They opened another location in 1853 in the former government hotel, at the corner of rue de Lille and rue des Saints-Pères. The firm prospered through the publication of low cost editions French classics. Their corpus of work includes maps, guides, novels, historical works, and essays. In June of 1983 the firm filed for bankruptcy and their assents were taken over by Presses de la Cité, a subsidiary of InfoMédia, which was itself liquidated in 2000. Very good condition. Folds into original ren linen binder. 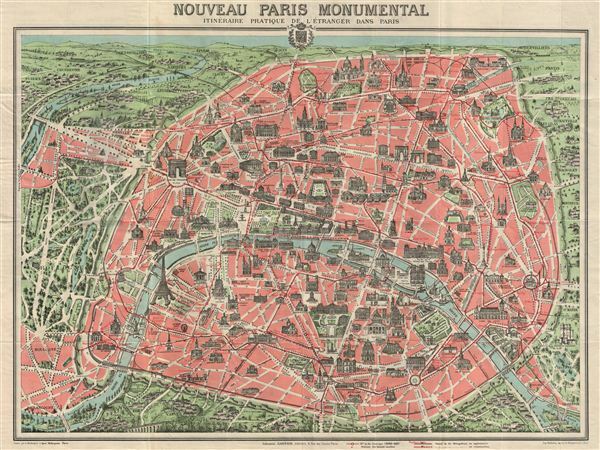 Verso features a monument map of the greater Paris area. Bibliographie Nationale Francaise, 06-02085 . DL 0500791 (BN, Cartes et plans) . Ge FF 22109. CPL Opaline 337777.